I’m very excited about this wine and eager to share it with you! Yes, it was on Instagram and Facebook yesterday, but here I get to talk about it just a little bit more! There are four wineries from Alba/Asti area in Piedmont that have pooled their resources to share an Export Manager and other expenses such as trade show costs to give everyone equal exposure. Rizieri, Tenuta Montemagno, Bric Cenciurio and Dogliotti work together to bring some great wines into our market. Arturo Verotti from Rizieri paid us a visit in May, and brought with him a Ruché made by his counterpart at Tenuta Montemagno. If you’ve never tasted a Ruché, you absolutely must! I tasted Ruché at Vinitaly, but nothing can describe being able to taste it again, here on my home soil, and to be able to introduce others at my table to this grape. An indigenous grape from Piedmont, making a great comeback and starting to show itself well in different parts of the world. The best come from Castagnole Monferrato and Scurzolengo. Ian D’Agata in his book Native Wine Grapes of Italy says: “If there is one Italian grape that wine lovers really ought to know, it is Ruché”. I agree wholeheartedly! He further states: “well made Ruché is a thing of beauty…with a red berry cocktail quality to its aromas and flavors”. Again, I couldn’t agree more. 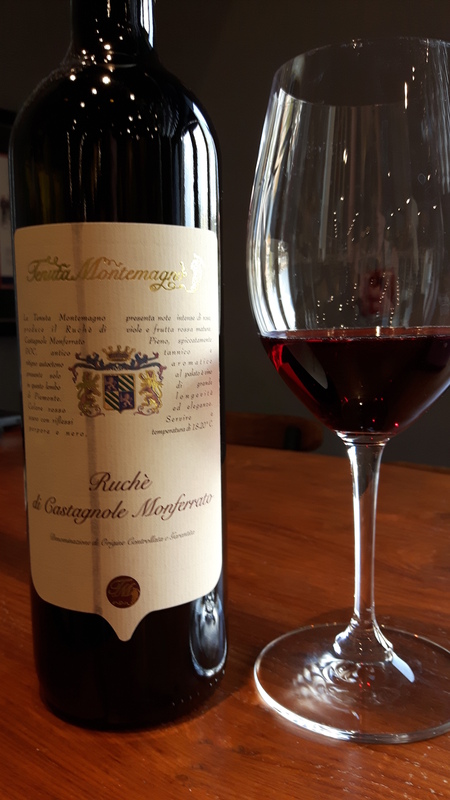 The Tenuta Montemagno Ruché has many of those same attributes with high volumes of lavender, cinnamon spice and sweet red cherry on the nose, along with that true red berry cocktail quality in the mouth with red plums, red cherries and raspberries along with sweet cinnamon spice, lavender and hints of black pepper. High alcohol but balanced well with a high, effervescent acidity. I’m wondering if a slight chill on this wine wouldn’t soften it even further and bring out more of the red berry cocktail quality. So juicy and delicious, and even more exciting, fitting into our Thirty Something category, coming it at $38.95 on the shelf! Cin Cin! This entry was posted in Thirsty Thursday, Varietals, wine and tagged autochthonous, Enotri, fruit, indegenous, Italy, Piedmont, red berries, Ruché, spice. Bookmark the permalink. I like how you do a short background for each wine before you give your opinions about the wine. Appreciate the extra effort! Thanks! I feel like that is just as important as the wine itself! Love your site. Great information, especially about a country I am less familiar with than the US and Spain – I live in Napa and have dual US-Spain citizenship. Italy is a new adventure for me. Check out our wine country blog at http://www.topochinesvino.com and follow us if you like what you see. Thank you so much and thanks for reading! I love Spanish wine also and look forward to learning more and more about their wines also!